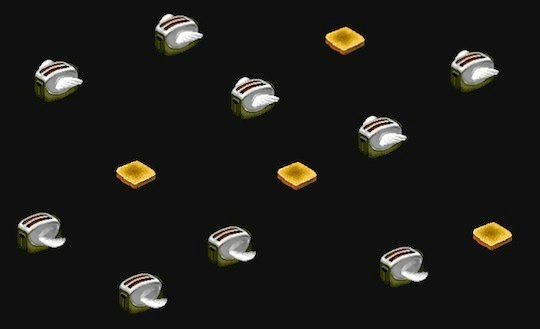 A Washington-based coder named Bryan Braun has recreated one of the curiosities of the early PC age: animated screensavers featuring flying toasters. And the resurrection has been effected using cascading style sheets. For the young or forgetful, the late eighties and early 90s were the time of the animated screensaver. The cathode-ray-tube monitors of the day were felt to suffer from “burn-in”, a condition that meant images displayed for thousands of hours would etch themselves in ghostly form on the screen. That shading made using early editions of Mac OS, Windows 3.x or OS/2 even more miserable than was already the case on the anaemic hardware of the day. Animated screen savers were the antidote and became a business for a software outfit called Berkeley Systems, whose After Dark screen saver compendium adorned many a PC. Burn-in turned out to be very difficult to achieve, but for a while their animated screen savers were a thing, and clearly a thing capable of inspiring nostalgia. Hence Braun's efforts, detailed here, which reveal that rebuilding the screensaver wasn't seem horridly complex. Braun's also offered the code for his efforts on GitHub, complete with the a nicely retro-styled menu system you can see here. Is this really what Meg Whitman meant by 'innovative new computing experiences'? So where has the legal 'right' to 10Mbps broadband gone?